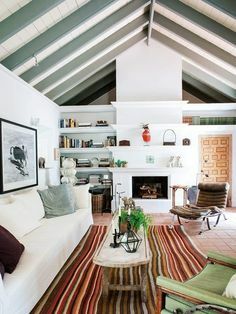 This living room shows a fresh decor that works perfectly throughout the year, from spring to winter. Behind the project: Victoria and Sylvia Melián, two sisters, master interior designers, who have been working together since 2006 under the label Melián Randolph. As in all their projects, in this living room they have shown great personality, audacity and a unique chic touch. The result is a fresh decor based on the sum of different elements. This gorgeous mix is fruit of a laborious previous project and a special talent to harmonize all the elements. 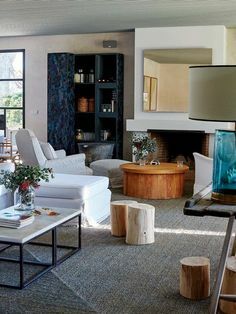 A large rug anchors the living area which features two Kennedy sofas by Blasco & Blasco, with green velvet cushions. The area is completed with two steel poufs, designed by Sylvia Melián. and two garden chairs of the 50s found in Youtopia. In the living room there are many vegetable motifs that contribute to a fresh decoration: photographs, green moss velvet, natural flowers, antique garden chairs and, especially, the great oil painting by Patricio Cabrera. 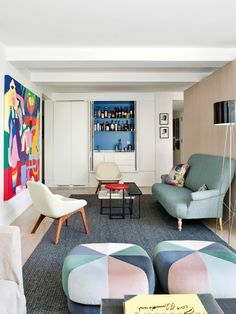 A Liberty chaise longue by Blasco & Blasco has been placed between the living and the dining area. The back wall has been highlighted with an anthracite gray color. The touches of green energize the black and white scheme. The dining chairs are from Miss in Demeure. 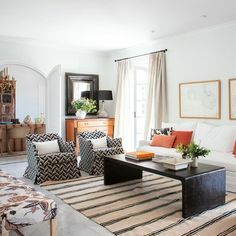 This living room appeared on the cover of Nuevo Estilo Magazine in 2012, but its fresh decor continues to be trendy. 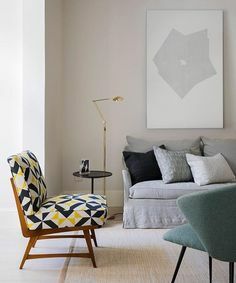 After its renovation, this modern apartment should become the perfect backdrop for a decoration with antiques, as the owners had a collection of old paintings, sculptures and tapestries. A mobile sculpture in iron, by José Onieva, leads to a second living area. In the foreground, a sofa with covers made with a Serendipity Fabrics linen. Behind, an antique chaise longue and a Belgian tapestry from the 17th century. In charge of this project has been María de la Osa. The large windows are dressed with linen blinds that let the light through. The pair of identical sofas are from Blasco & Blasco. The flowerpots were acquired at an auction and the Persian carpet is a piece of family heritage. Painting by Jordi Alcaraz acquired in Anmoder. The legacy armchair has been re-upholstered with an animal print fabric. 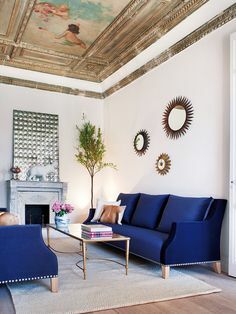 Modern architecture enhances the decor with antiques as this two interesting Carlos III consoles. More photos by clicking aquí.